Could antimatter be really be used to destroy the Vatican? BEAUTIFUL MIND : Cal Poly’s Jennifer Klay has researched atomic physics at Lawrence Berkeley and Livermore labs, Brookhaven, and CERN. 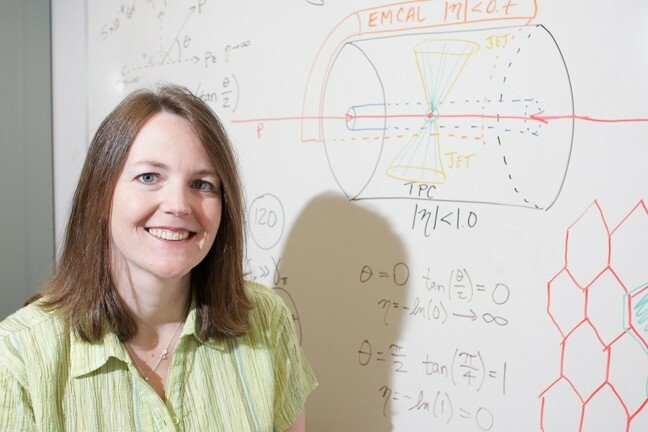 Jennifer Klay, Cal Poly assistant professor of physics, will give a public lecture about the film Angels and Demons at 7:30 p.m. on Monday, May 18 in the Chumash Auditorium on campus. What makes her qualified to be a film critic? The movie centers on an apparent plot to destroy the Vatican using stolen antimatter produced by the new Large Hadron Collider (LHC) at CERN, the European particle physics laboratory in Switzerland. Klay is a researcher at the forefront of scientific investigation into the nature of matter, having worked at particle accelerators around the world, and is the principal investigator of a National Science Foundation grant who has been working with Cal Poly students at the collider in Geneva. Klay will discuss how plausible capturing antimatter would be to carry out the diabolical scheme that Tom Hanks, the film’s star, tries to thwart. But her own work is much more intriguing: She’s on a quest approaching the origin of the universe, the ultimate boundary between everything and no thing, and her destination seems very near. Klay—and some of her students—are working on A Large Ion Collider Experiment (ALICE) at the LHC, which will recreate under laboratory conditions what theoretically occurred less than a nanosecond after the Big Bang. The LHC is a gigantic, $6-billion circular instrument nearly 17 miles in circumference buried 300 feet below the Swiss city and a series of French hamlets. The colossal structure is in essence the world’s fastest speedway, capable of accelerating atomic nuclei (massive lead ions, for the ALICE study) to almost the speed of light and then smashing them head on with another beam of such ions traveling in the opposite direction. Collisions in the LHC will generate temperatures more than 100,000 times hotter than the interior of the Sun, to liberate the most basic of all particles, quarks and gluons, in a plasma like the universe at the instant of birth. The experiment will monitor the plasma as it expands and cools, observing how the other particles that constitute matter today progressively ensue. More than 1000 scientists from 94 institutes in 28 countries are collaborating with Klay and her team on ALICE, whose specific work has included computer simulations of a detector that’s key to the experiment. Klay is a vivacious, captivating speaker whose explanations of science at the frontier of physics sound like adventure stories, not baffling theories. The event promises to be more entertaining than the movie. For more information contact 756-1250. The San Luis Obispo County Health Commission is looking to recruit a consumer representative as well as alternate members to fill vacancies. In addition to attending monthly meetings, commissioners serve on committees and should be available for at least 10 hours of commission-related work a month. For more information or an application, call Jean White at the Health Agency/Public Health Department at 781-5520 or visit slocounty.ca.gov/health/publichealth/healthcommission. Ed Connolly, Omar Sanchez, and Matt Fountain compiled Strokes&Plugs this week. Send your business and nonprofit news to strokes@newtimesslo.com.